It’s officially summer and we are just weeks away from the 4th of July, 3 to be exact. Though I won’t be having a 4th of July party, I still like to add touches of Americana to the night. Remember this 4th of July Food and Decor post from a few years back? 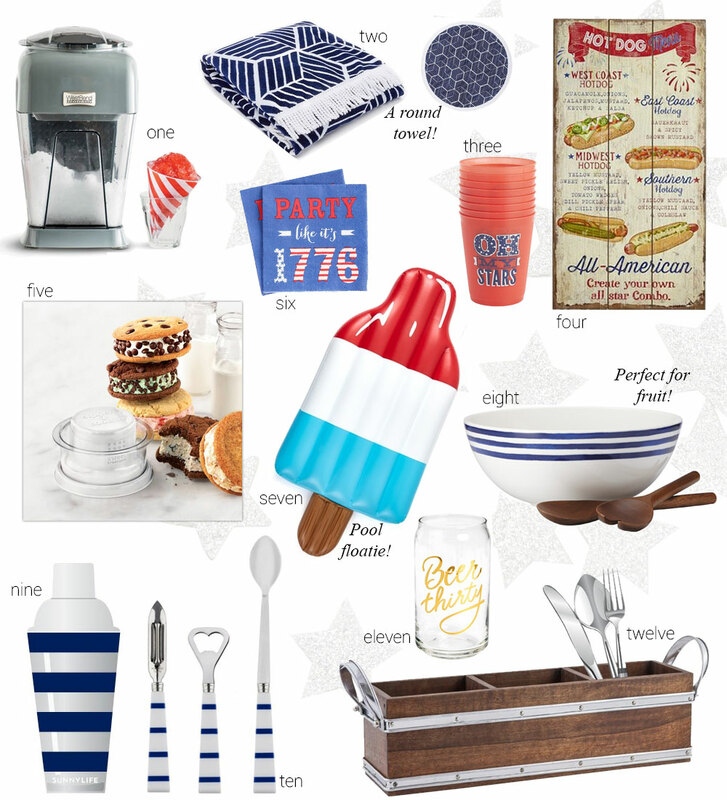 – While I do like to throw in some 4th of July specific items, things like this striped cocktail shaker are great all summer long. Same goes for this bowl… wouldn’t it be perfect filled with some fresh watermelon?! – Most 4th of July meals are serve yourself, having a utensil caddy is nice to keep everything in order. Go ahead and fill it with disposable silverware! – What’s a holiday without dessert? Exactly! So of course I had to include that in this roundup. Snow cones and Ice cream sandwiches are a perfect summer treat. Both of these are also pretty easy to do, and much funner than just picking some up at the store. – What’s a 4th of July party without cooling off from the heat in the pool? There are so many fun pool floats available right now, but this Ice Pop float is ready for the occasion. By the way… I won’t be doing a 4th of July makeup tutorial this year, but you can check out last years 4th of July makeup look here!